DB2 very efficiently manages data in large buffer pools. To search for data in a large buffer pool does not consume any more resources than searching in a smaller buffer pool. With this in mind, do not skimp on allocating memory to your DB2 buffer pools. So, just how big should you make each buffer pool? One rule of thumb is to make the buffer pool large enough to hold five minutes worth of randomly read pages during peak processing time. To clarify, the goal is that once a page has been read from disk into the buffer pool, the goal is to maintain it in memory for at least five minutes. The idea is that a page, once read, is likely to be needed again by another process during peak periods. Of course, your particular environment may differ. If you have metrics on how frequently a piece of data once read, will need to be read again, as well as how soon it will need to be read, you can use that to tinker with your buffer pool size and parameters to optimize buffer pool data residency. But it can be difficult to know how much data is read at peak processing time, as well as even knowing when peak processing time will be, before an application is coded. You can gather estimates from the subject matter experts, end users, and application designers, but it will just be estimates. Over time you will have to examine buffer pool usage and perhaps re-size your buffer pools, or move objects from one buffer pool to another to improve performance. Of course, you will want to make sure that you have not allocated so much memory to DB2 buffer pools that the system starts paging. When there is not enough real storage to back the buffer pool storage, paging activity will cause performance to degrade. What is paging? Paging occurs when the virtual storage requirements for a buffer pool exceeds the real storage capacity for the z/OS image. When this happens DB2 migrates the least recently used pages in the buffer pool to auxiliary storage. If the data that was migrated is then accessed those pages must be brought back into real storage from auxiliary storage. When you detect that DB2 is paging you should either increase the amount of real storage or decrease the size of your buffer pools. Only DBAs or systems programmers should be allowed to add or modify the size of DB2 buffer pools. And these qualified professionals should be able to analyze the system to know the amount of memory available (real and virtual), as well as the amount being used by other system software and applications. 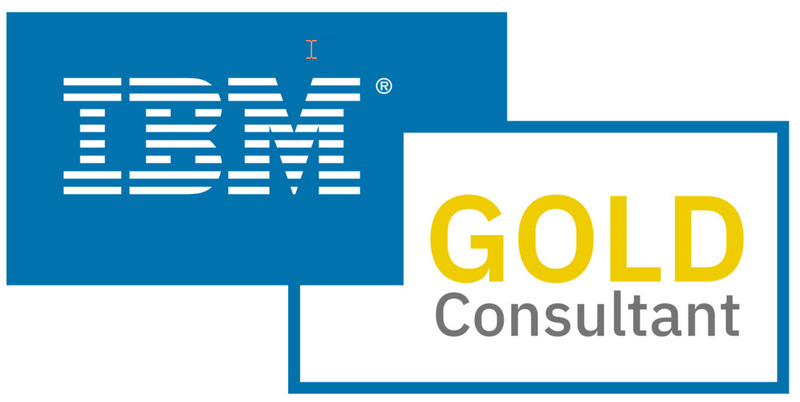 For a good overview of mainframe virtual storage consult the following link from IBM. The last blog post here at the DB2 Portal offered up a brief overview of the types of tools that you might want to consider to help you use, manage, and administer your DB2 applications and databases. But it did not really look into the capabilities and requirements for modern DB2 tools and solutions. Today’s DB2 management and administration tools should provide intelligent automation to reduce the problems inherent in the tedious day-to-day tasks of database administration. Simple automation is no longer sufficient. Modern data management software must be able to intelligently monitor, analyze, and optimize applications using past, present, and future analysis of collected data. Simply stated, the software should work the way a consultant works--fulfilling the role of a trusted advisor. The end result should be software that functions like a consultant, enabling your precious human resources to spend time on research, strategy, planning, and implementing new and advanced features and technologies, instead of rote day-to-day tasks. Furthermore, modern database tools should provide cross-platform, heterogeneous management. For most medium-to-large IT organization it is not enough to manage just DB2 for z/OS systems, for example. The ability to offer administrative and development assistance across multiple DBMS platforms (for example, DB2 for LUW, Oracle, SQL Server, MySQL, and so on). Most companies have multiple DBMSs that need to be managed -- not just one... and DBAs and developers are precious resources that increasingly are being asked to work on more than just a single DBMS. When the tools can manage cross-platform, the learning curve is reduced and productivity can be enhanced. And while it is true that today’s DBMS products are becoming more self-managing, they do not yet provide out-of-the-box, lights-out operation, nor do they offer all of the speed, usability, and ease of use features of ISV admin, management, and development tools. An organization looking to provide 24/7 data availability coupled with efficient performance will have to augment the capabilities of their DBMS software with data management and DBA tools to get the job done. As data management tasks get more complex and DBAs become harder to find and retain, more and more database maintenance duties should be automated using intelligent management software. Using intelligent, automated DB2 tools will help to reduce the amount of time, effort, and human error associated with implementing and managing efficient database applications. As a user of DB2, which I'm guessing you are since you are reading this blog, you should always be on the lookout for useful tools that will help you achieve business value from your investment in DB2. There are several categories of tools that can help you to achieve this value. Database Administration and Change Management tools simplify and automate tasks such as creating database objects, examining existing structures, loading and unloading data, and making changes to databases. Without an administration tool these tasks require intricate, complex scripts to be developed and run. One of the most important administration tools is the database change manager. Without a robust, time-tested product that is designed to effect database changes, database changes can be quite time-consuming and error prone. A database change manager automates the creation and execution of scripts designed to implement required changes – and will ensure that data integrity is not lost. One of the more important categories of DB2 tools offers Performance Management capabilities. Performance tools help to gauge the responsiveness and efficiency of SQL queries, database structures, and system parameters. Performance management tools should be able to examine and improve each of the three components of a database application: the DB2 subsystem, the database structures, and the application programs. Advanced performance tools can take proactive measures to correct problems as they happen. Backup and Recovery tools simplify the process of creating backups and recovering from those backup copies. By automating complex processes, simulating recovery, and implementing disaster recovery procedures these tools can be used to assure business resiliency, with no data being lost when the inevitable problems arise. Another important category of DB2 tool is Utilities and Utility Management. A utility is a single purpose tool for moving and/or verifying database pages; examples include LOAD, UNLOAD, REORG, CHECK, COPY, and RECOVER. Tools that implement and optimize utility processing, as well as those that automate and standardize the execution of DB2 utilities, can greatly improve the availability of your DB2 applications. You might also want to consider augmenting your utilities with a database archiving solution that moves data back and forth between your database and offline storage. Governance and Compliance tools deliver the ability to protect your data and to assure compliance with industry and governmental regulations, such as HIPAA, Sarbanes-Oxley, and PCI DSS. In many cases business executives have to vouch for the accuracy of their company’s data and that the proper controls are in place to comply with required regulations. Governance and compliance tools can answer questions like “who did what to which data when?” that are nearly impossible to otherwise answer. And finally, Application Management tools help developers improve application performance and speed time-to-market. Such tools can improve database and program design, facilitate application testing including the creation and management of test data, and streamline application data management efforts. Conceptually, DB2 is a relational database management system. Actually, some might object to this term instead calling DB2 a SQL DBMS because it does not conform exactly to Codd’s relational model. Physically, DB2 is an amalgamation of address spaces and intersystem communication links that, when adequately tied together, provide the services of a database management system. "What does all this information have to do with me?" you might wonder. Well, understanding the components of a piece of software helps you use that software more effectively. By understanding the physical layout of DB2, you can arrive at system solutions more quickly and develop SQL that performs better. This blog entry will not get very technical and won't delve into the bits and bytes of DB2. Instead, it presents the basic architecture of a DB2 subsystem and information about each subcomponent of that architecture. Each DB2 subcomponent is comprised of smaller units called CSECTs. A CSECT performs a single logical function. Working together, a bunch of CSECTs provide general, high level functionality for a subcomponent of DB2. DB2 CSECT names begin with the characters DSN. Distributed Data Facility services (DDF). The SSAS, or System Services Address Space, coordinates the attachment of DB2 to other subsystems (CICS, IMS/TM, or TSO). SSAS is also responsible for all logging activities (physical logging, log archival, and BSDS). DSNMSTR is the default name for this address space. (The address spaces may have been renamed at your shop.) DSNMSTR is the started task that contains the DB2 log. The log should be monitored regularly for messages indicating the errors or problems with DB2. Products are available that monitor the log for problems and trigger an event to contact the DBA or systems programmer when a problem is found. The DBAS, or Database Services Address Space, provides the facility for the manipulation of DB2 data structures. The default name for this address space is DSNDBM1. This component of DB2 is responsible for the execution of SQL and the management of buffers, and it contains the core logic of the DBMS. Database services use system services and z/OS to handle the actual databases (tables, indexes, etc.) under the control of DB2. Although DBAS and SSAS operate in different address spaces, they are interdependent and work together as a formal subsystem of z/OS. 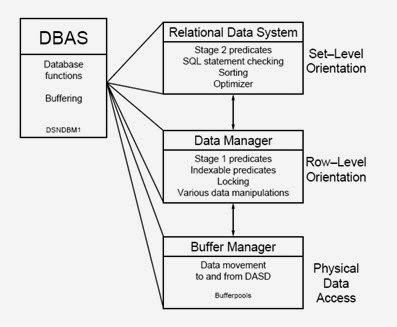 The Buffer Manager handles the movement of data from disk to memory; the Data Manager handles the application of Stage 1 predicates and row-level operations on DB2 data; and the Relational Data System, or Relational Data Services, handles the application of Stage 2 predicates and set-level operations on DB2 data. Figure 1. The components of the Database Services Address Space. The next DB2 address space, DDF, or Distributed Data Facility services, is optional. DDF is required only when you want distributed database functionality. If your shop must enable remote DB2 subsystems to query data between one another, the DDF address space must be activated. DDF services use VTAM or TCP/IP to establish connections and communicate with other DB2 subsystems using either DRDA or private protocols. DB2 also requires an additional address space to handle locking. The IRLM, or Intersystem Resource Lock Manager, is responsible for the management of all DB2 locks (including deadlock detection). The default name of this address space is IRLMPROC. Finally, DB2 uses additional address spaces to manage the execution of stored procedures and user-defined functions. In older releases of DB2 (V4 and V5 era) these address spaces are known as the Stored Procedure Address Spaces, or SPAS. For current DB2 releases (V8 and later), however, the z/OS Workload Manager (WLM) is used and can define multiple address spaces for stored procedures. So, at a high level, DB2 uses five address spaces to handle all DB2 functionality. DB2 also communicates with allied agents, like CICS, IMS/TM, and TSO. 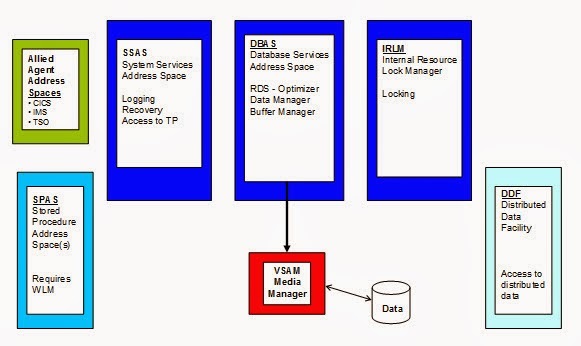 And database services uses the VSAM Media Manager to actually read data. A summary of the DB2 address spaces and the functionality they perform is provided in Figure 2. Figure 2. The DB2 address spaces. Well, here we are in March... the cold and snow will hopefully soon be behind us... and thoughts of Spring and warm weather start to fill our minds. And that can only mean one thing - the annual North American IDUG DB2 Tech Conference will soon be upon us! So if you haven't started to plan on how to get funding to attend it is time to start! The 2014 North American IDUG DB2 Tech Conference will be held in Phoenix, Arizona the week of May 12 thru May 16… and if you are a DB2 professional (and since you’re reading this I will assume that you are) then you should be making plans to attend. As it does every year, IDUG features all of the latest in DB2 technologies, networking opportunities and the technical content you need to be successful. There are over 100 technical sessions to choose from at this year’s conference! The conference also hosts Special Interest Groups (SIGs) on nine different DB2 and data-related topics, so I’m sure you can find something interesting and helpful to attend. And you can use the conference as a vehicle to get your DB2 certification! All DB2 Tech Conference attendees have the opportunity to take a Free IBM Certification Examwhile in Phoenix! Each attendee may take one exam for free and if they pass they are eligible for a second free exam. You can also arrive early and attend a full day session on a DB2 topic of your choice (at an additional cost). Every year IDUG provides several in-depth Educational Seminars delivered by some of the top DB2 consultants out there. This year you can sign up to see Bonnie Baker deliver one of her last DB2 classes before she retires in June 2014 (we’ll miss you Bonnie)! And don't forget the Vendor Exhibit Hall, which boasts all of the DB2 tools and services providers that you’d ever want to see – all under one roof in one convenient place. And the vendors always offer a lot of goodies and giveaways, ranging from t-shirts and pens to tablets and other nice gadgets. I'll be presenting this again at IDUG, this year on the topic of Big Data for the DB2 Professional. So be sure to stop in to say "Hi" and chat about DB2, big data, or your favorite topic du jour! The IDUG DB2 Tech Conference is the place to be to learn all about DB2 from IBMers, gold consultants, IBM champions, end users, and more. With all of this great stuff going on in Phoenix this May, why wouldn't you want to be there!?! ?